Recently, a customer posted on our Facebook page about how she uses beading as physical/occupational therapy for her young daughter. 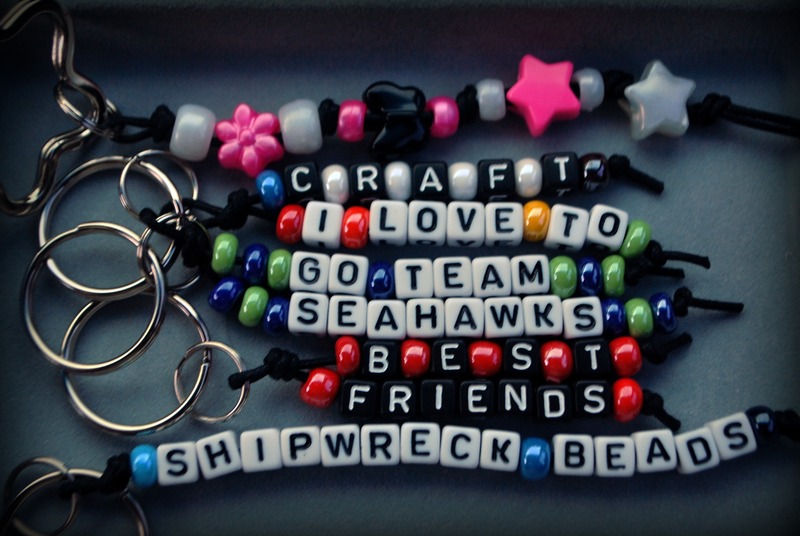 It got me thinking about my own daughter, Goose, and how much she loves crafting and beads especially. This past weekend we drove to Spokane, nearly 5 hours away, and I thought that a beading project might be the very thing to keep her entertained. It may have only worked for about 30 minutes, but with a 5-year-old, you have to take what you can get. I gathered some kid-friendly supplies and we got on the road! 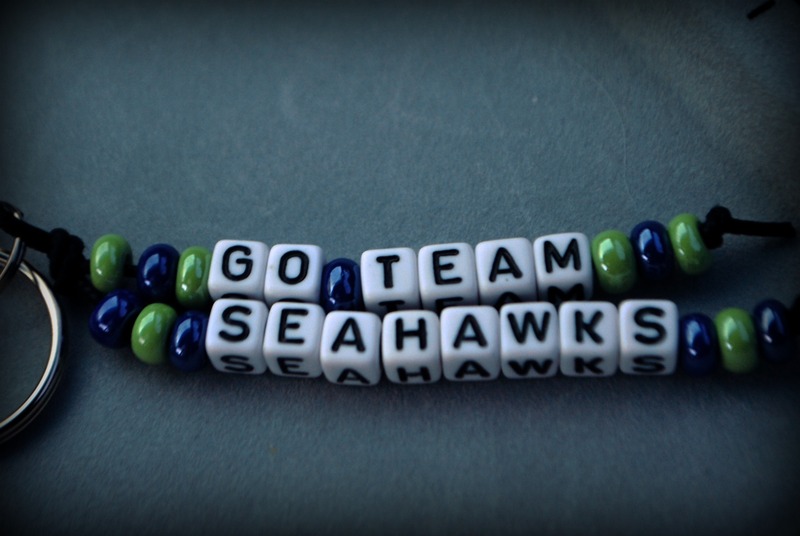 All you need are plastic letter beads, some waxed cord (I used the 1.5mm), split rings, and some of our versatile mixtures. I chose beads with larger holes so they would fit over the cord both double and single strands. 1SB301 for me and PL525 for my daughter. 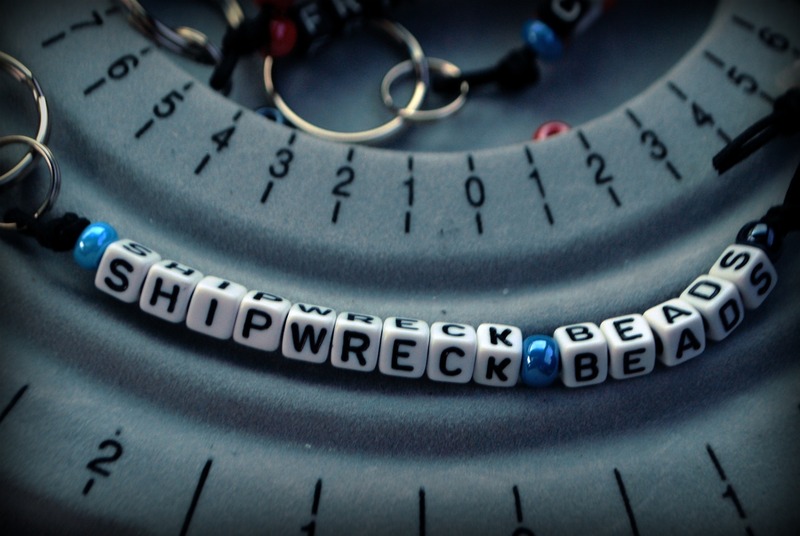 Key chains are a fun and easy project for you to do with your kids. Goose made one to accessorize her new school backpack (she starts kindergarten in a week!!!) and of course, lost it so I couldn’t take a picture of it to share. If I find it, I will. I used two sizes of spilt ring 12mm and 24mm. I tied about 18 inches of cord to the smaller split ring and then gave Goose the bag of mixed plastic beads and let her pick out her own. Anything pink or purple or sparkly were preferred. I also picked up one of these great travel layout boards by Beadsmith for our trip. It’s the same as a regular layout board except it comes with a clear plastic lid that snaps on to keep your project in place. I used the board for my projects and Goose used the lid, which has a lip on it and made a great surface for her to work on. During the course of our travels, the bead board got tossed around a bit and the lid stayed securely in place. 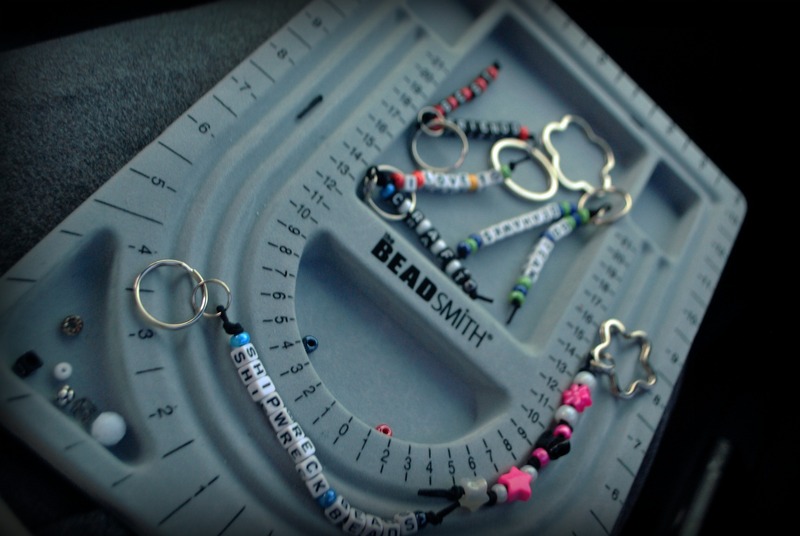 This is definitely something I would recommend to anyone who beads on the go. This is an inexpensive and easy project for kids (or adults) and would even be a fun birthday party activity. It was a good way to kill a little bit of time in the car and we both enjoyed ourselves. Stop by the blog later this week to see a fun little project I’m working on to celebrate fall.